Many of you have heard about the various carbon proposals pursued federally and statewide in recent years. These efforts have prompted both congressional and state legislation, including various executive orders and citizen initiatives. 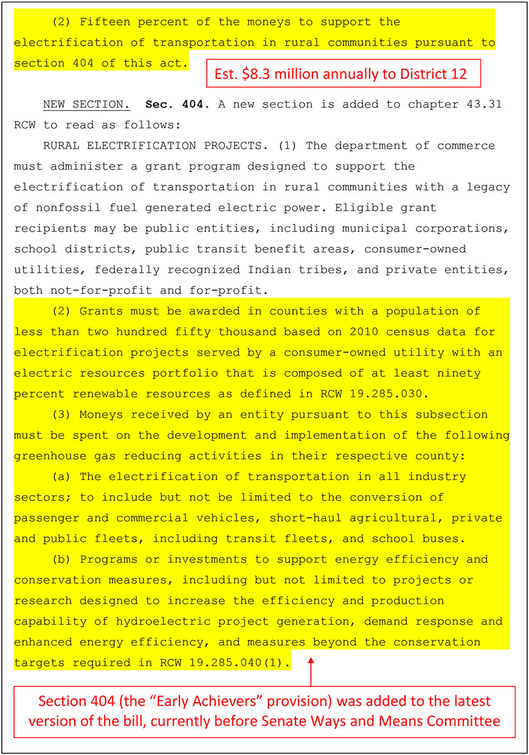 Our state has not yet approved a carbon or climate policy, but Senate Bill 6203 (titled “Reducing carbon pollution by investing in rural economic development and a clean energy economy”) is advancing through the legislative process and could come to the Senate floor for a vote in the near future. In preparation for this bill coming up for a vote, I am working hard to analyze the proposal, understand its impacts, and collect feedback. I have never supported a carbon tax, but I would like to better understand an issue like this and thoughtfully consider its impacts before voting. How would the carbon tax work? As proposed, the tax would begin on July 1, 2019 at an initial rate of $12 per metric ton of carbon emissions. Beginning July 1, 2021, the proposed tax increases by $1.80 per year until the rate is $30 per metric ton. 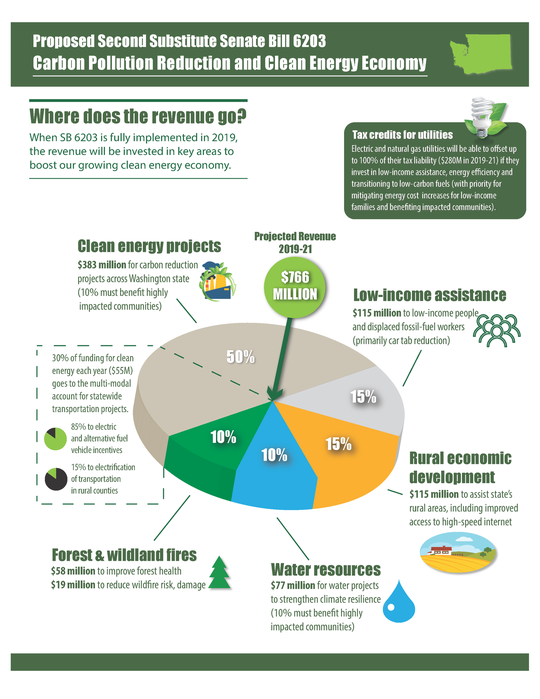 The tax is not specifically on gas, but on carbon – across all sectors. Fortunately, here in the 12th District, we get our power from renewable, carbon-free hydropower and are the owners of our hydropower system. This means that the tax would not adversely impact our electric rates. Some also believe that if a tax is applied on carbon-related electricity (like coal and gas generation), our carbon-free generation might actually increase in value over time. Should SB 6203 pass, the cost of vehicle fuel will increase in our area beginning in 2019. Fuel costs are estimated to rise 10 cents per gallon, increasing less than 2 cents per year thereafter. This is estimated to cost the 12th District residents as much as $8 million per year (some estimates are much lower). On the other hand, Section 404 of the bill (see below) is estimated to benefit our area by at least $8 million per year. The bill also provides a multitude of grant opportunities that our region could compete for and receive, as well as exemptions for some industries but not all. For agriculture, on-farm gas and diesel is exempt from the proposed tax, but the fuel for the short-hauls (from orchards to packing sheds, for instance) and for the long-hauls (from packing sheds to ports) is not currently exempt. Other “trickle-down” impacts of the carbon tax could translate to increased costs for goods and services as well. Where would the revenues go? Grants awarded by the Department of Commerce for projects and incentive programs that reduce greenhouse gas emissions, industrial energy efficiency, clean transportation, and energy efficiency. What about the impacts of climate change? “The concern about climate change has been widely recognized on a global, national, and regional level. ‘Global warming’ refers to increases in global temperatures resulting from an accumulation of greenhouse gases in the atmosphere. Greenhouse gases include carbon dioxide, methane, and chlorofluorocarbons. These gases trap the sun's heat as it is radiated from the earth, and prevent it from escaping back into space. State and local governments are addressing climate change in their plans and policies and starting to take actions to reduce greenhouse gases.” Click here for more information. As your State Senator, I have heard from many constituents across the philosophical spectrum on the topic of climate change. I try hard to listen and balance the diversity of interests across our district when making decisions relating to this issue. While I personally do not have a strong opinion on either side of this question, I do know greenhouse gas emissions are global and any policy, in my opinion, shouldn’t have the effect of just shifting emissions to another state. Such an approach may reduce our own state’s emissions, but not our national or global emissions. The bill sponsors are aware of this concern. I do believe that this proposal would reduce emissions in our state and could result in environmental benefits. The proposal alone, however, is not likely to make a significant reduction in global emissions unless the United States and other countries (like China, India, and Russia) also take steps to reduce their emissions. Would our area receive a portion of the revenues? I pride myself on open and thoughtful communications and welcome responses from our community. A few prominent entities have expressed opposition to the proposal, which you can view in the letters from the Chelan County Commissioners and Wenatchee Valley Chamber of Commerce. Last Saturday, I met with elected officials, members of Building North Central Washington and others to discuss this legislation. Many of those attending, including Building North Central Washington and Douglas County Commissioners, expressed strong opposition. Chelan PUD has not yet taken a position on this bill. Some elected officials in attendance expressed concern about the likelihood of the bill passing in some form given our Democratic-controlled Legislature. Others expressed concern about the possibility of an initiative that, if approved, could result in a worse outcome. I would like to provide you an opportunity to share your thoughts directly with me. I also encourage you to communicate with your local elected officials so that they know your opinions on this issue. Having a thoughtful and respectful community dialogue on public policy is healthy for us all. I appreciate your taking the time to review this information and look forward to hearing your thoughts. Click here to take my survey. Your responses will be anonymous.